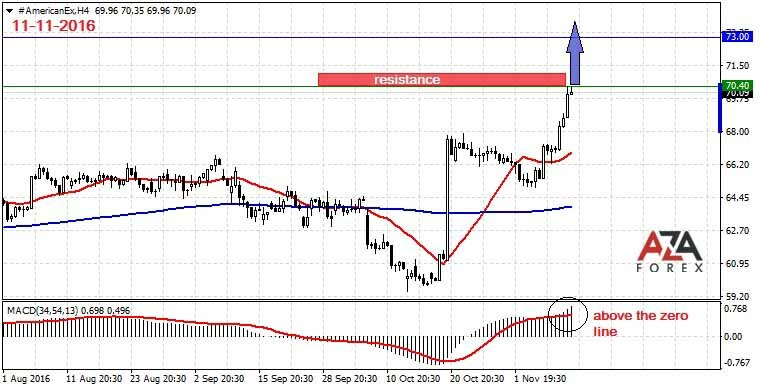 All the tips you need to win at forex and stock market. American Express shares rose and reached a level where we recorded a gain of 200 points. But it only encouraged us to further purchase of shares of the company. Now the US equity market is in an excited mood, and in many sectors, the assets grow in value. We must use this opportunity while investor’s activity remains at a high level. Moreover, companies had good prospects and now many of them are in preparation for the holiday season. They are optimistic with regard to new sales and can count on growth in the next quarter of 2017. Based on this revenue growth of small and medium-sized businesses and, accordingly, and American Express Company is projected. Almost 60% of retailers and small businesses believe that holiday sales will be much stronger in comparison to the previous year. 34% believe that they will remain at the same level. Such a positive attitude inspires confidence in many investors for buying shares American Express, as they are directly dependent on the cash turnover. Business based on the holiday season is also preparing for the increase in demand for holidaymakers services and hired additional staff to serve customers during the holidays. In selecting stocks for purchase for investments based on the long term, you can pay attention to the assets owned by Warren Buffett such as his company Berkshire Hathaway, which can be an excellent starting point. Today, Buffett is the richest investor in the world, and Berkshire Hathaway manages a shares portfolio worth more than $ 100 billion. Now they again bought in its investment portfolio shares of American Express and other companies. The choice of professionals will help novice investors to take the decision. Now American Express Company generates almost 5.5 billion profit in the year, and the brand remains recognizable worldwide. This company can increase its profit in the future, which means a real opportunity to make long-term investments. Middle-class buyers will be continually expanding, digital payments inevitably grow, as the number of users, also the strong brand recognition of high quality will grow. Therefore, we recommend to buy shares both for long-term investment and short-term speculation.